21 jun 2017 - Sinds de financiële crisis in 2008 is de wereldwijde oproep voor meer verantwoordelijk en duurzaam marktgedrag gegroeid. Hoewel het begrip Corporate Social Responsibility (CSR) steeds meer belangstelling trekt, blijft het een vrij abstract en vaag concept in de gebiedsontwikkeling. Rowie Huijbregts onderzocht in haar MSc-scriptie hoe particuliere actoren CSR kunnen gebruiken om duurzame stedelijke gebieden te ontwikkelen. Dit artikel is alleen in het Engels beschikbaar. Pressing societal challenges such as urbanization, gentrification and climate change have been influencing the design, construction and exploitation of buildings and urban areas by market players involved in urban development. Since the 2008 financial crisis, the global call for more responsible and sustainable market behavior has grown. In Dutch property and urban area development, such behavior, in turn, seems to have influenced a shift from a “hit and run” mentality towards a focus more on exploitation and end use. Moreover, such behavior seems to influence nowadays the chance for market success, reputation and value of companies. Within this context, the concept of Corporate Social Responsibility (CSR) has been gaining attention. Today, developers, investors and corporations voluntarily explore corporate solutions to societal challenges. They setup organizational units to manage CSR programs and to report on CSR achievements. The latter phenomenon of “good governance” has resulted in a great amount of socially responsible behavior and investment policies and publications. Yet, CSR remains a rather abstract and vague concept within Dutch urban planning. Its meaning, historical and political notion, and implementation in business practice are often unclear. What is CSR? Where does it come from? And what does it imply when designing, constructing and exploiting properties and urban areas? In her MSc thesis, Rowie Huijbregts researched how private actors, within Dutch urban development, can use CSR to develop sustainable urban areas. This study focuses in particular on the private actor type “developing investor” (Dutch: “ontwikkelende belegger”). This market player develops properties and urban areas (partly) in behalf of his own investment portfolio. Concerning his investment capacity and focus on the long-term, this actor type should be intrinsically motivated to deliver and exploit properties and urban areas that are durable and retain quality over time. In the aftermath of the financial crisis, this actor type fits the urgency of concentrating on long-term revenues, the end user and juxtaposed value chains such as the energy, water and waste management sectors. Given the fact that CSR is historically and politically associated with a rather Anglo-Saxon model of capitalism, which consists of liberal market economies with limited governmental control, the use of CSR by two Anglo-Saxon developing investors in the United States and Hong Kong is studied. In order to gain insight in the use of CSR in the Dutch urban planning practice, a developing investor based in Amsterdam is studied. It is important to point out here that Dutch urban planning is most rooted in the Rhineland ideology of capitalism, which consists of social market economies and governmental interference, but is now under influence of Anglo‐Saxon characteristics such as liberalization, privatization and deregulation. Based upon the three case study findings, lessons are drawn about the use of CSR from Anglo-Saxon developing investors for Dutch developing investors. Subsequently, a CSR “maturity model” is developed that enables Dutch developing investors to assess their current application of CSR with the intention of improving it. CSR can be used by the Dutch developing investor as a means to optimize the impact of his three main business disciplines upon society. These business disciplines include property and urban area development, investment and fund management, and own business management. By reflecting upon the impact of these three disciplines, the developing investor is able to determine the responsibility additional to governmental legislation and shareholder concern – conditions for CSR –he can and is willing to take to minimize negative impact and maximize positive impact. The maturity of use of CSR correlates with the extent to which the impact of business upon society is optimized. This implies a continuous process of measuring the impact of business upon society, selecting material sustainability issues, setting quantifiable goals, formulating strategies to achieve these goals and implementing these strategies into business practice – see Figure 1. Figure 1 Continuous use of CSR by developing investor, own ill. 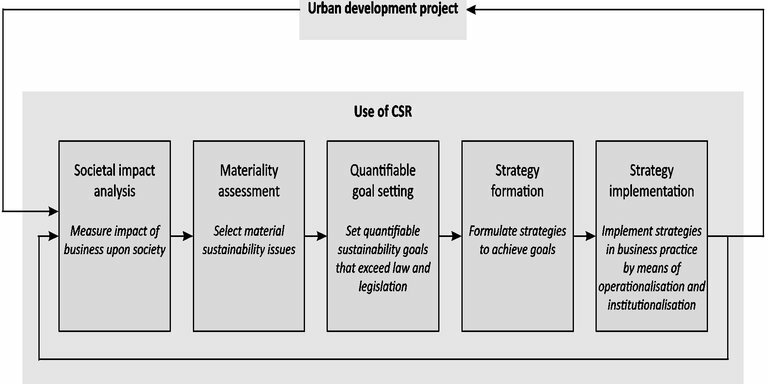 The formulation of the main research question implicates that the use of CSR by developing investors contributes to the development of sustainable urban areas. This study ends with the presumption that the continuous use of CSR indeed assists private actors in creating increasingly sustainable urban areas. The supposition is that the more material issues are selected and sustainability strategies are implemented, the more sustainable the output of urban development processes is. The use of CSR is a necessary but not a sufficient condition for sustainable urban development in the Netherlands. Regarding ongoing liberalization, privatization and deregulation, it appears as though the Dutch are better off with CSR in urban planning than without it, if those are the only two choices. However, when CSR remains to be only a voluntary and individual business activity, many national and global societal issues are impossible to solve – see also Kinderman’s (2009) interesting discussion paper “Why do some countries get CSR sooner, and in greater quantity, than others?”. In its current voluntary format, CSR is no match for further liberalization of the Dutch urban development practice. In addition, the current trigger for applying CSR seems not to be the positive impact it can have on society, environment or economy but rather the client and market demand as well as increased marketing opportunities. It remains to be seen whether CSR initiatives and activities in Dutch urban planning evolve from well-intentioned and symbolic towards more solid and institutionalized action programs. Lees hier de gehele scriptie.